We love our cats. But sometimes they bite -- hard. 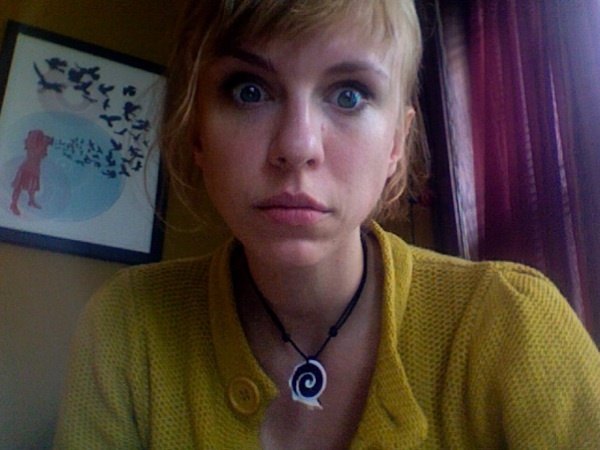 These training methods will end the bad behavior. 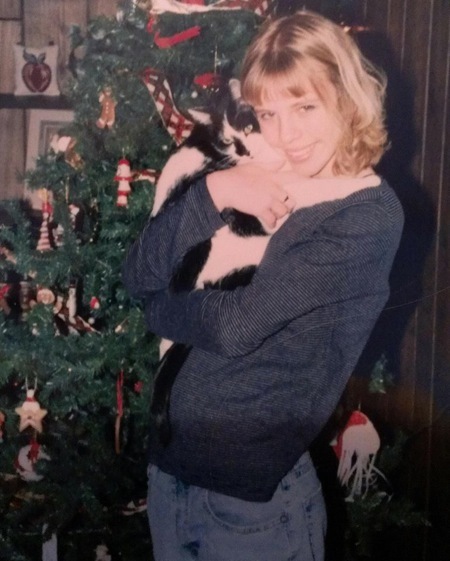 When I was a kid, it took six years of consistent whining and pleading to persuade my parents to let me get a cat. I finally wore them down the summer following my first-grade year. When we went on our annual trip to visit my mom’s family, my parents let me choose a kitten from my aunt’s farm. After much deliberation, I selected a little black-and-white tomcat who started purring when I picked him up. Almost defiantly, Sweets did not live up to his name. Afraid that the cat would keep them awake, my parents insisted on keeping him in the basement at night. Sweets did not appreciate this, and he showed it through behavior. He made the basement door his own personal scratching post, an unwise move that landed him at the vet’s office to be declawed. Seemingly to spite my parents, he learned how to open the door just by watching us (because unlike my current cats, he was one smart fellow). He would free himself from his nightly exile to roam the house and wreak havoc upon all things breakable. Perhaps worst of all, though, was the swift precision with which he could use his fangs to poke holes in human hands. This was partially a result of being declawed, of course, as he’d been stripped of his primary defense mechanism. But it was also a behavior learned through play. 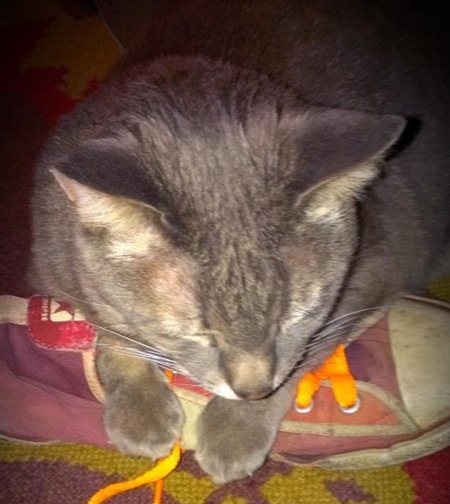 When he was a kitten, it was cute when Sweets clawed and gnawed on my dancing phalanges. But when he got older it just freaking hurt. Turns out this behavior is a fairly common misfortune — and you can correct it through proper training. 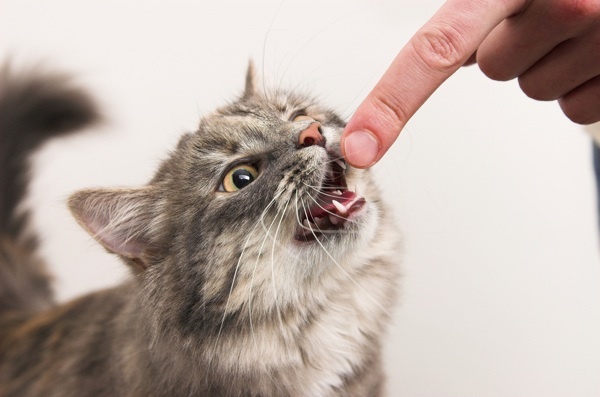 Here are five ways to get your cat to stop attacking your fingers already. What causes it? Are you doing anything to encourage it? 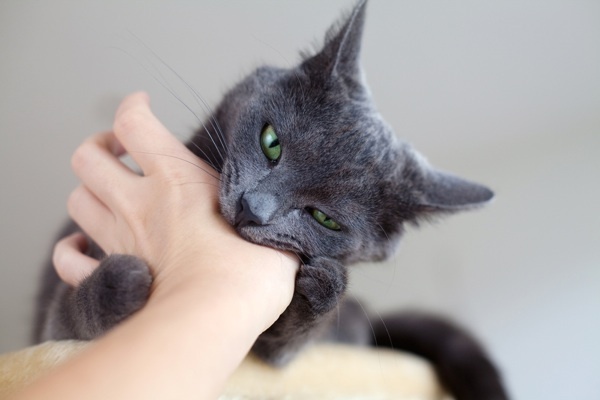 Cats often bite or scratch in response to stress or in self-defense. It can help to create a calm environment for the cat by turning down the television or not singing along to "Me & Bobby McGee" by Janis Joplin at the top of your lungs. Cats can also become aggressive if children or others are playing with them too roughly. Sweets, for example, became terrified any time he heard the doorbell ring, and Bubba Lee Kinsey cannot handle more than two houseguests at a time. Knowing this helps me to prepare and ensure Bubba has a safe haven in the bedroom if I’m having friends over. 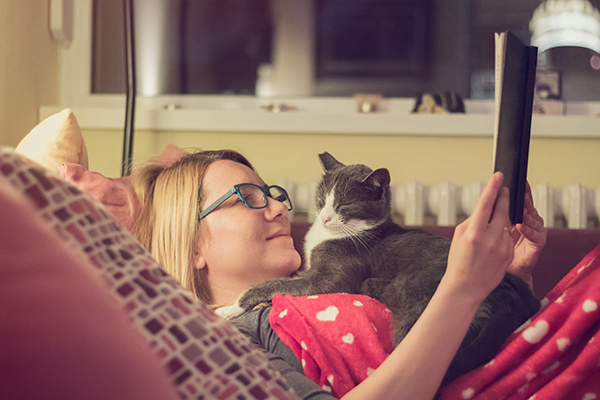 Your cat doesn’t like being bored any more than you do. If your cat was trained to view your fingers as toys, he will direct his need to hunt and kill toward your unsuspecting hands. Give your cat some alternatives, like a feather wand or a catnip banana — and be sure to experiment with a variety of toys to see what he likes. Then play with him every day. Another thing that worked wonders for my aggressive Bubba Lee Kinsey was adopting my other cat, Phoenix. In those dark, pre-Phoenix days, Bubba was alone a lot while I went to work, the gym, the bar, etc. — and he was frequently and randomly aggressive toward me. But Phoenix has chilled him out a lot, as they keep each other company and play together. And even though she’s smaller, Phoenix totally dominates. When your cat bites, clap your hands, scold him with a firm NO, and assert your dominance by staring at him directly and fiercely. Never strike or shout at your cat. Then leave the room and ignore the cat for several minutes. 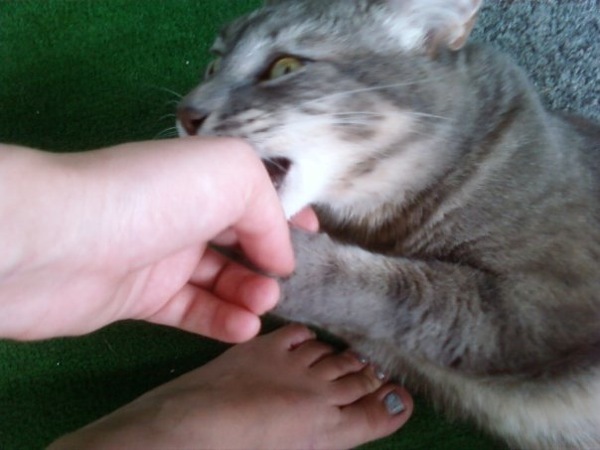 If your cat is timid, however, do not be overly aggressive. 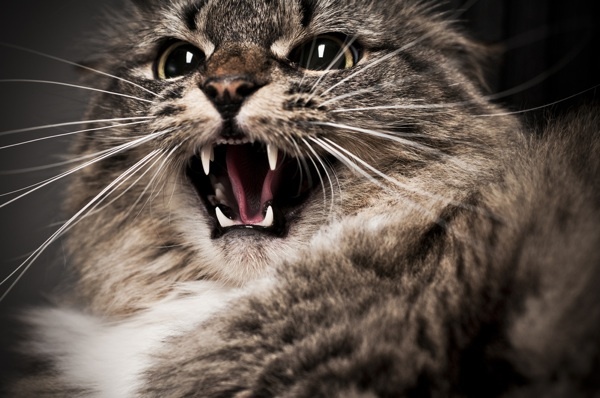 Be firm, but do not frighten your cat, as fear is one of the reasons cats bite or scratch. And if your cat is not spayed or neutered, get that done ASAP; this will make it easier for you to be the dominant mammal in the house. 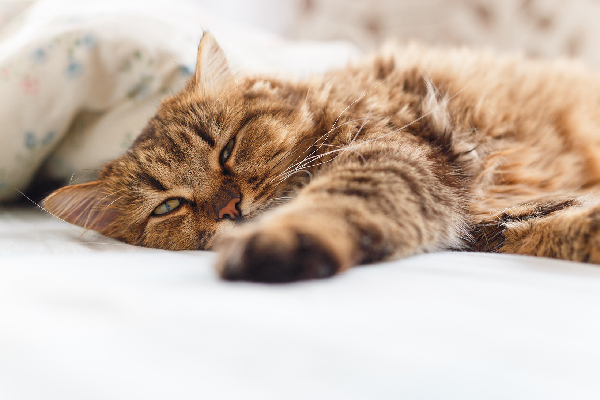 It’s simple — when your cat bites or scratches, squirt him with a spray bottle or small water gun. The only problem: It needs to be done consistently and directly following the incident, or the cat will not learn to associate the two events. It won’t do any good if, still reeling from your injury, you spray your cat two minutes later. 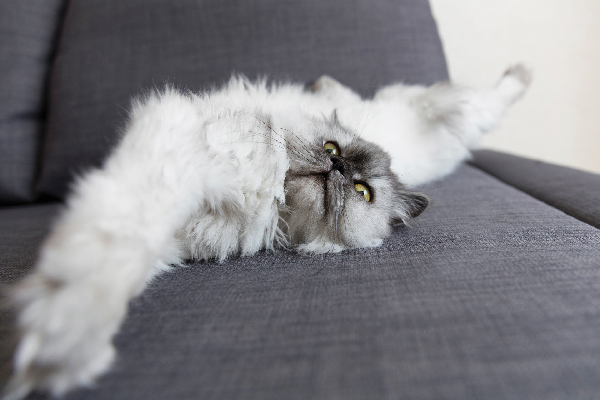 In fact, it might actually perpetuate your cat’s negative behavior. This method is probably most effective if your cat typically bites in a specific place and time, such as when you’re typing on the computer or watching reruns of Seinfeld every night. That way you can be prepared with the spray bottle at the ready. If you haven’t started letting your kitten play with your hands — don’t! It might be cute when the cat weighs two pounds and has baby teeth, but when there’s a 15-pound behemoth with fully formed fangs digging in to your flesh, it’s a different story. 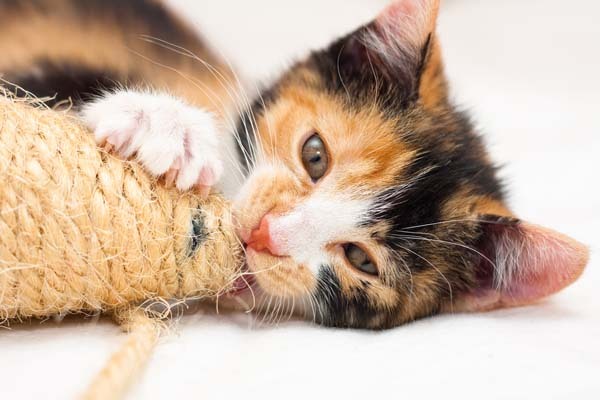 Teach your kitten to play with real toys from the start, and you won’t have to spend the next 15 years with your hands and arms covered in the kinds of scratches and scars that make other people worry.